These delicate flowers get their shape from sealing the edges with a flame. 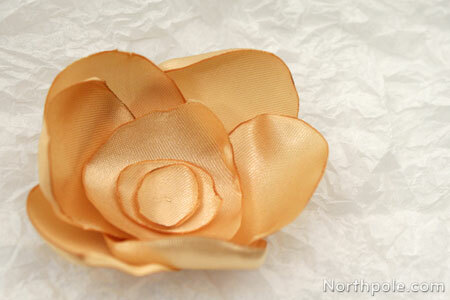 We used a polyester satin, but you could try another type of synthetic material. (Please note: Stick with synthetic materials for this project, as natural fibers will burn!) 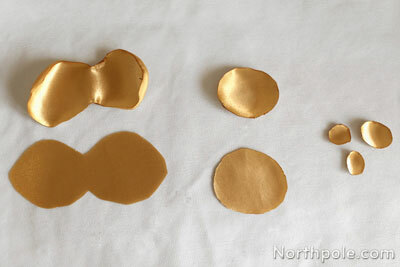 After you’ve made several of these gold flowers, you can scatter them on a table to accent a holiday centerpiece, attach them to a Christmassy burlap wreath, or turn them into a festive hair accessory like these headbands and hairclips. Cut circles in a range of sizes. First cut the larger circles, and then cut out the smaller circles from the scraps. Note:�The petals will shrink a little when melting the edges, so cut your petals slightly larger than you want the finished product to be. 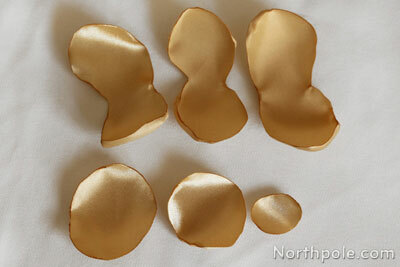 Cut some peanut shapes by folding the fabric up about 2 inches. (We find it helpful to pin the fabric in place since it is very slippery.) Cut a horse shoe shape where the points of the “u” are on the fold line. 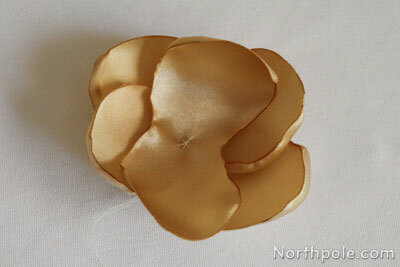 Unfold peanut shapes and lay on a flat surface. Next seal the edges of each petal. 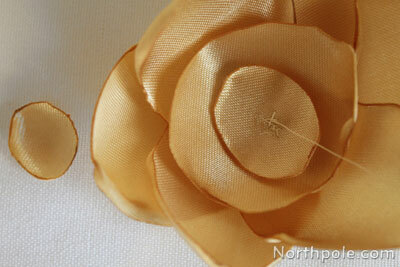 Sealing edges does two things: it seals the frayed edges and it makes each petal three-dimensional. Using a lighter or a candle, very carefully and slowly bring the petal to the flame. USE EXTREME CAUTION as the fabric is flammable. Only put the petal near the flame until the edge is sealed—when it just begins to melt. Rotate the petal continuing the seal all edges. 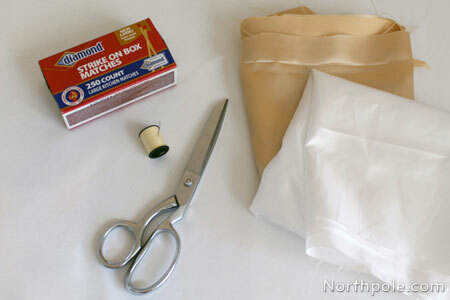 You don’t want to melt the fabric too much; it will get very sticky while it is hot. Note: DO NOT put the petal IN the flame, you will scorch the fabric and might even catch it on fire. We must repeat—DO NOT put the petal IN the flame!! Thread the needle and set aside. Assemble the flower. First lay all the petals together to decide how you want the flower to look. Then take it apart. We used 3 peanut shaped pieces and 3 circles. 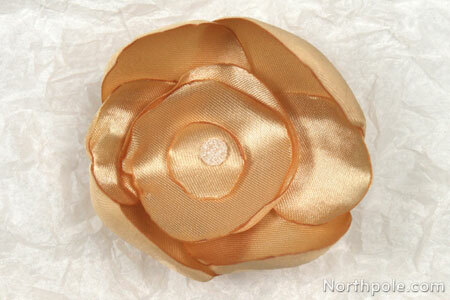 Lay the 3 peanut pieces together and sew a few stitches in the center.� We added a few extra stitches around the perimeter of the center so that the petals were not too floppy. Add the next 2 circle pieces and sew in the center. 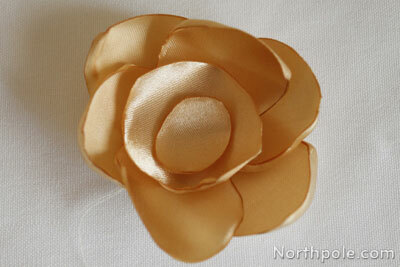 Finally, add the last petal and sew in place. 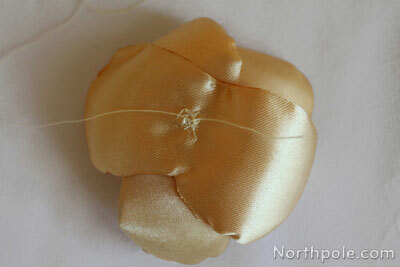 Bring the thread to the back of flower and tie a couple knots. Purchasing new fabric for crafts can become pretty pricey, so here are some tips to help you not break the bank: sift through the remnants bin at your craft store, look around your home for garments you no longer wear, or shop at a local thrift store.